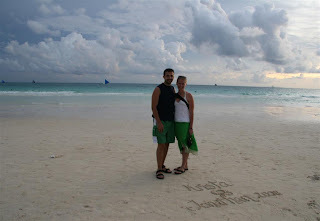 If you search for the best beaches in the world, on every list is Boracay White Beach. For over three miles the beautiful white sand is a paradise for beachcombers. The warm waters of the Sulu Sea offer reprieve from the hot sun and hours of fun. This is truly the best beach that we have ever been on. Here are a few pictures for you to enjoy! The sand here is unbelievable it is softer and finer than any sand we've see previously, but yet after the tide goes out, you can ride your bike on the beach! From beautiful sand you can make some beautiful sand castles! This photo was not edited in Photoshop, it is that beautiful there! I didn't have have a tripod at the time, but they still turned out pretty good. We can't wait to go back to the Philippines!